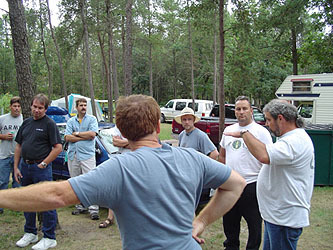 Vintage divers gathered from seven different states to dive two hose regulators in late August of 2004. 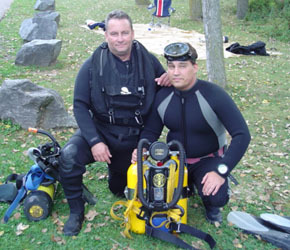 The divers met at Lake Wazee, a former quarry, near Black River Falls, Wisconsin. 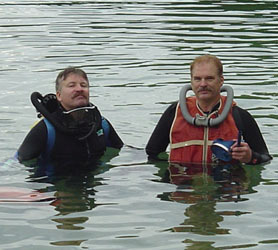 Tim Donnay, left, and Jerry Lang, right, are testing out the waters of Lake Wazee on Saturday, August 28th. The entire Wazee group gathered for the Saturday morning dive. 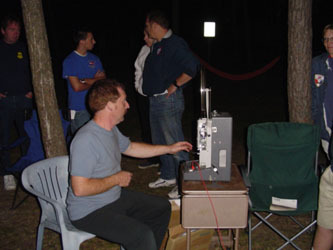 Everyone used a double hose regulator for this event. Ryan Spence travelled to Wazee all the way from Louisville, Colorado. He is using a La Spirotechnique Mistral. Bryan Pennington, of Overland Park, Kansas, and Rob Studnicka of Ohio. Both flew in for the event. Dan Barringer of Vintage Scuba Supply, Selma, OR, showing vintage Sea Hunt 16mm films. 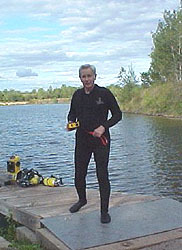 Ryan Spence, wearing his authentic Cousteau team silver wet suit. 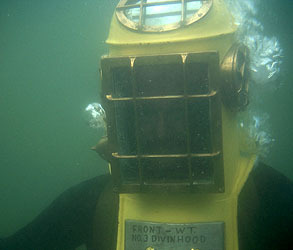 The replica Cousteau style tank shroud and lighted helmet were made by Ryan himself. 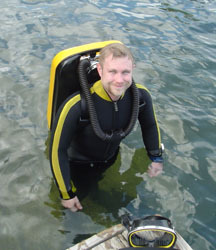 Mike Follett, of Minneapolis, Minnesota under the clear waters of Lake Wazee. Visability was around 30 ft.and the water temperature was quite warm, around 60 degrees. Frans Carlson of Brooklyn Park, Minnesota, was generous to bring along his 1930's Miller Dunn "Divin Hood". 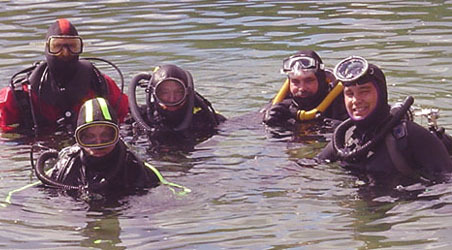 It provided a unique experience for those divers willing to try it. 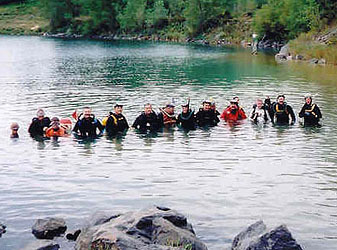 This group of dedicated vintage divers went down to 105 feet with a variety of two hose regulators. 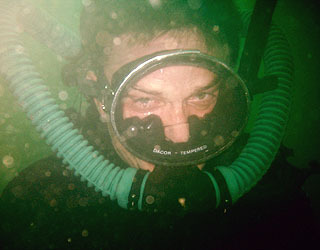 Visibility at 100 ft. depth was extraordinary - around 75 ft.
Frans Carlson, Grand Pooh-Bah of the Inland Divers Vintage Dive Club, and his Miller Dunn helmet sitting on the dock behind him. 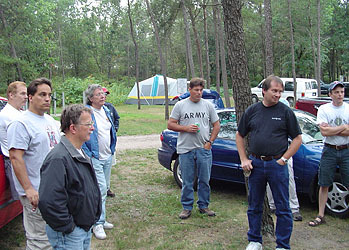 All Wazee photos courtsey of: ©2004 Bryan Pennington and ©2004 Frans Carlson.